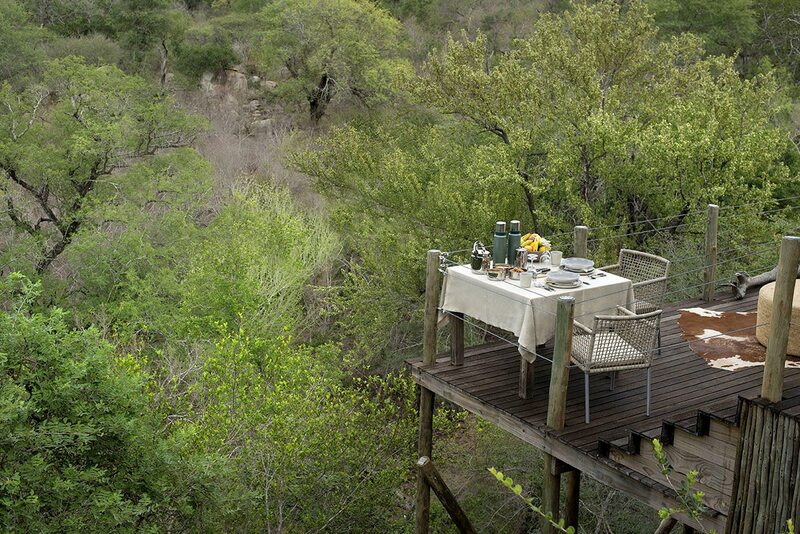 Spend a night away from your lodge in a treehouse in the heart of the African bush. 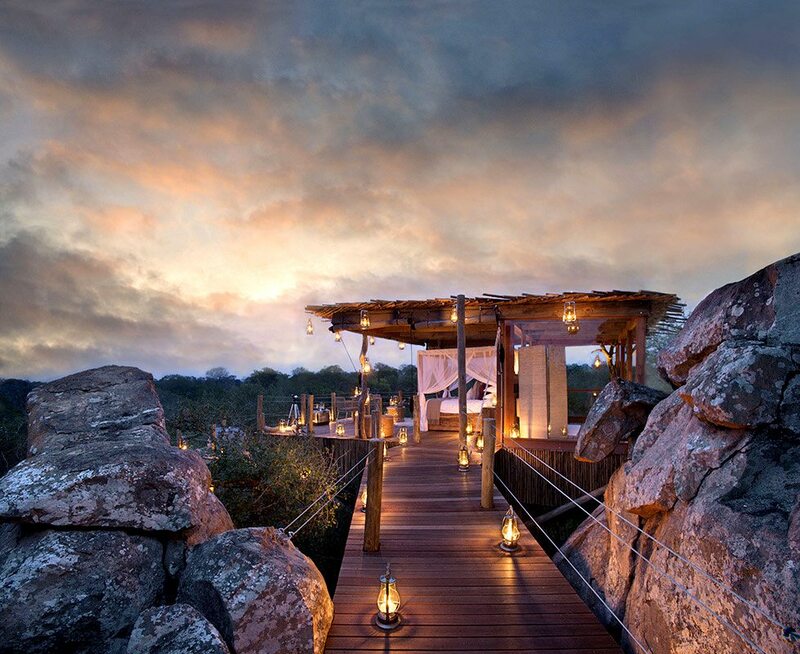 Lion Sands Game Reserve, in South Africa‘s Greater Kruger National Park, offers romantic treehouse accommodation at Kingston Treehouse, allowing guests to sleep under the stars in the wilderness. 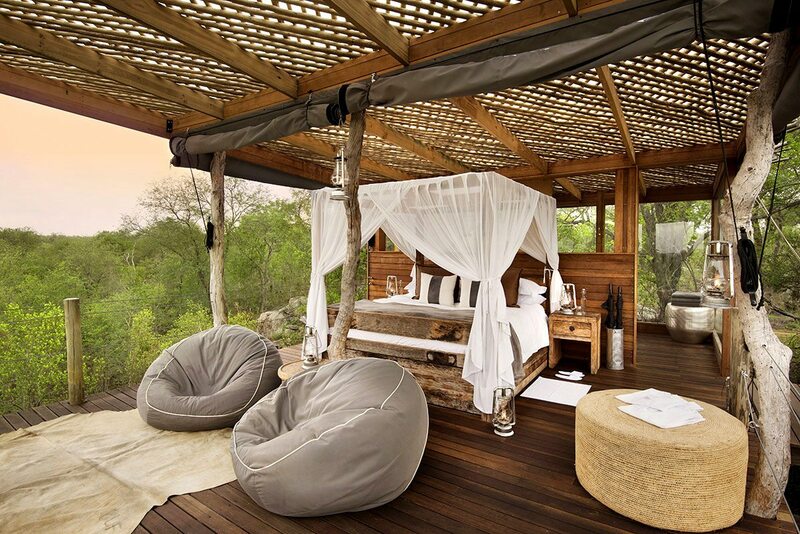 The highlight of our luxury South African safari was a night in a treehouse. 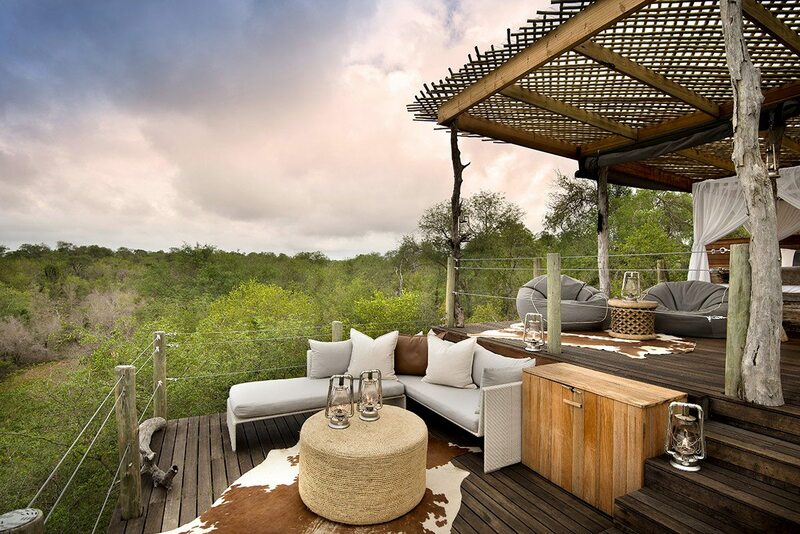 Lion Sands is a top-notch, private game reserve within the Sabi Sand, one of South Africa’s finest wildlife destinations. 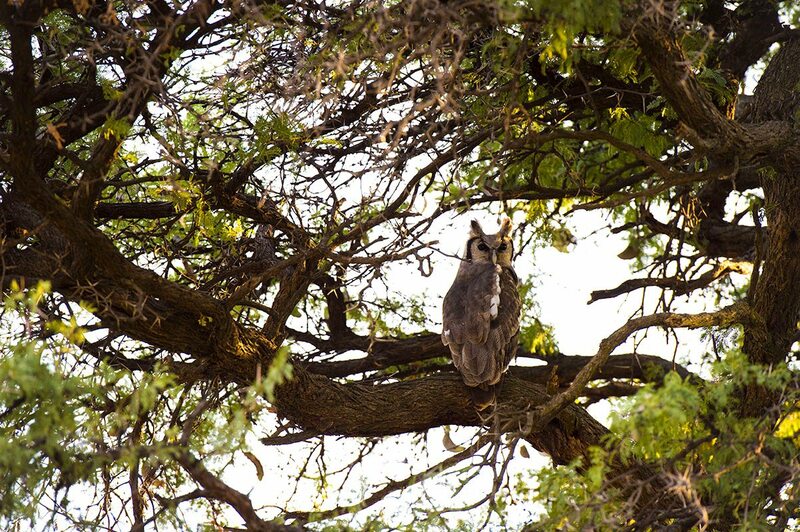 It offers (as an add-on to your stay in its lodges) three treehouses – Chalkley’s, Tinyeleti and Kingston – where guests can sleep under the stars on their own in the wilds of the Greater Kruger National Park. 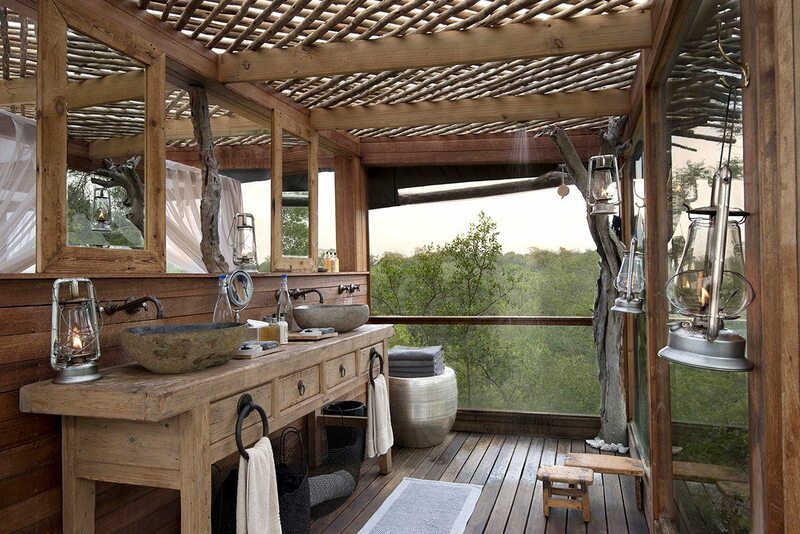 We chose Kingston Treehouse, which was only a short walk from Ivory Lodge, the camp where we were staying. It was a night we’ll never forget. My partner and I packed an overnight bag with essentials, leaving our suitcases and other belongings at Ivory Lodge. I must admit to some reservations about leaving the incredible luxury of our villa for a night in the bushveld, but these doubts were soon allayed. Late that afternoon, we set off for Kingston Treehouse on foot, led by George, our guide. We made our way through magnificent white boulders and across a small drawbridge. The short amble brought us to a magnificent treehouse. Kingston is a secure and lavish platform under the stars, with all the mod cons, but it affords an experience as wild as the animals that roam beneath it. 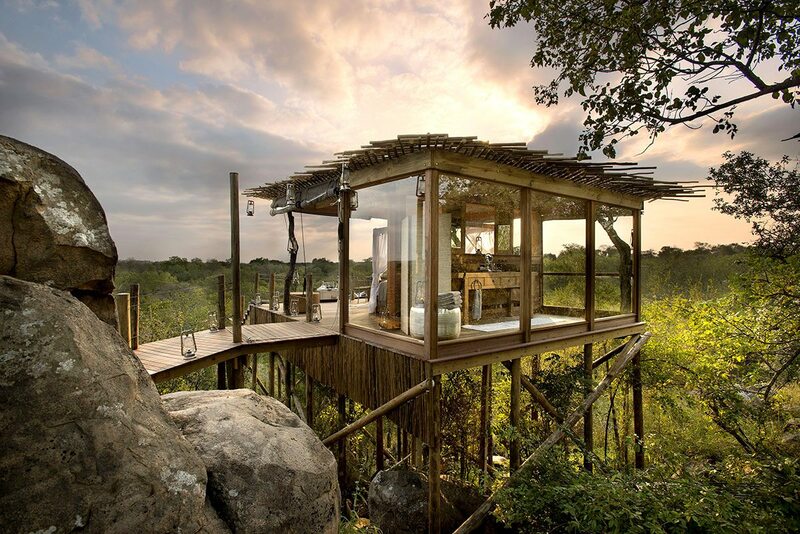 The treehouse stands high on stilts, constructed entirely from wood and glass, with contemporary decor in understated hues of grey, white, black and purple. There was a big four-poster bed with draped mosquito nets and the wilderness spread out at our feet. It was perfect. It was time for George to head back to camp and leave us to our own devices. ‘You’ll have radio contact with the rangers,’ he said. ‘But I’m sure you won’t need us. 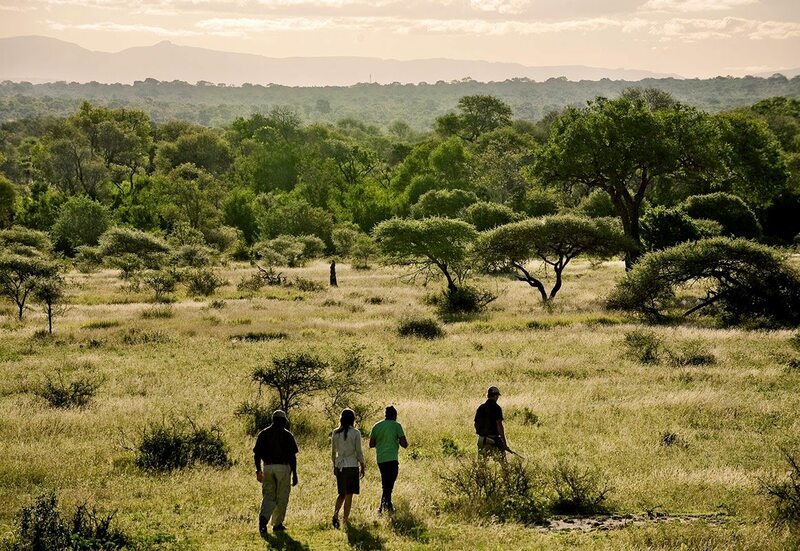 You’ll also find some cellphone reception; but don’t expect any Wi-Fi out here in the bush. 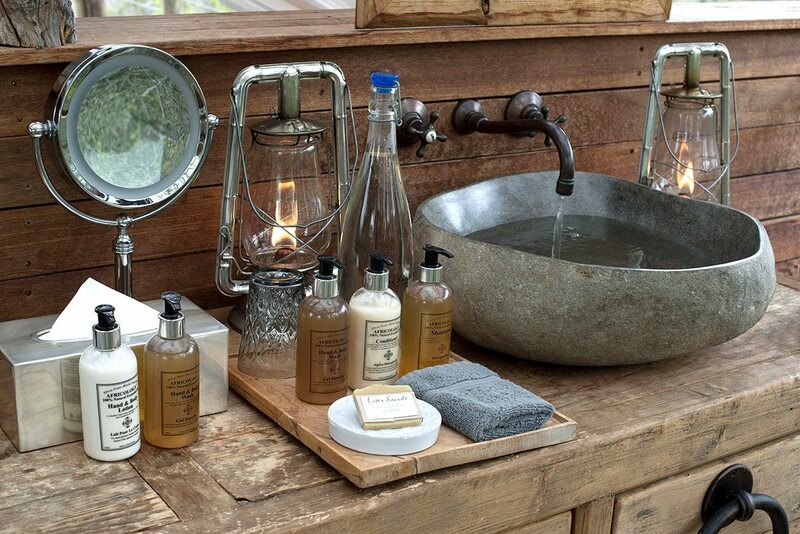 This is the best place for an internet detox…’. And with that, he was gone, leaving us alone in our paradisiacal nest. I had a shower and changed into more relaxing clothes. By now, the sun was settling on the horizon. We sat on our deck, taking in the vastness and the silence. I poured us both a glass of bubbly. As dusk approached, the bush transformed itself from its day to its night incarnation. Somewhere a hyena whooped. It sent a shiver down my spine. Dinner was a meze-style picnic (packed specially for us in a gourmet basket), enjoyed al fresco. Lanterns lit the deck: it was impossibly romantic. Darkness descended quite swiftly. The stars shone brighter than I can remember them, the Milky Way coursing overhead like a giant cloud of diamonds. The moon was a silver sickle in the west. We watched nature’s Big Screen cinema for hours. The only other place I’d seen a heaven like this was in a planetarium back home. That glittering night sky brought on a sense of peace, a sense of wonder at our place in the universe. Eventually, we dragged ourselves away from the stars and slipped into bed. 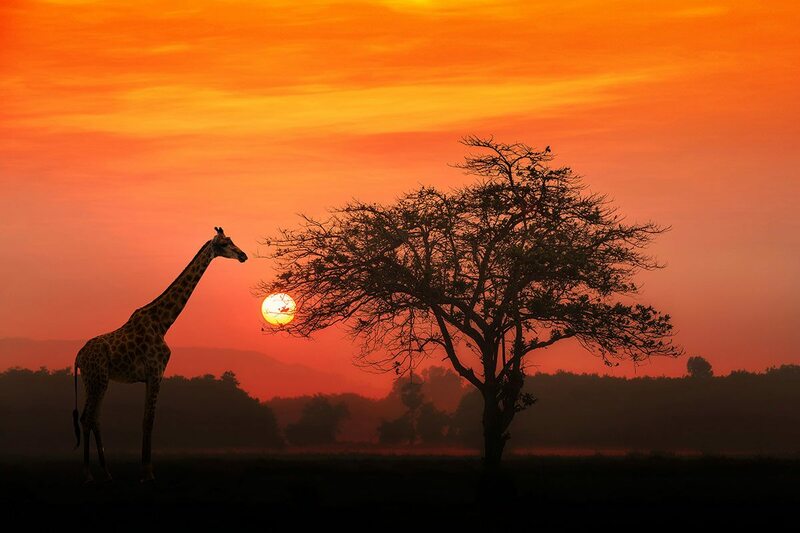 I nodded off to the gentle honking of hippo some way off, a sound which echoed through the bush. It was the ideal lullaby. Deep in the night we woke to lion roaring. It was an unearthly sound that had us sitting bolt upright in bed. George had told us that at night, male lion roar to advertise their presence to would-be interlopers, be they nomads passing through or the neighbouring pride hoping to extend their territory. Were we the interlopers!? These roars send the message that all is well with the pride and that the males are still active and ready to defend their domain. The thinner night air enables the sound to carry over several kilometres. But to us, it sounded like they were right below our platform. What a thrill! We woke again just as the sun lifted off the horizon. I made us some coffee, enjoyed with freshly baked biscuits while sitting in our bed watching the bushveld come alive. I felt a pang of longing to remain when George arrived to walk us back to camp. 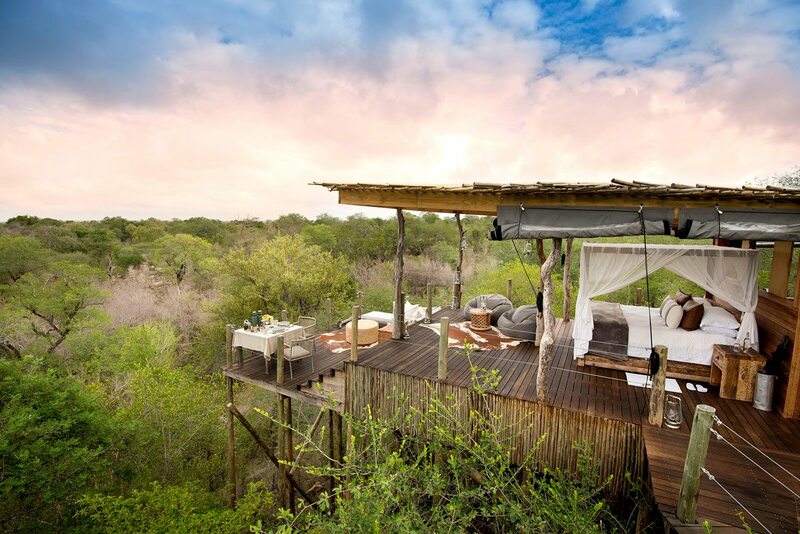 I must say, the treehouses at Lion Sands are the perfect destination for the hopeless romantic, the adventurer or anyone who needs a complete digital detox. For us, it had been a chance to initiate a very intimate relationship with the bush. It affected me so much that I can still feel the exact sensation of lying in that bed under the stars and listening to the sounds of the African night. 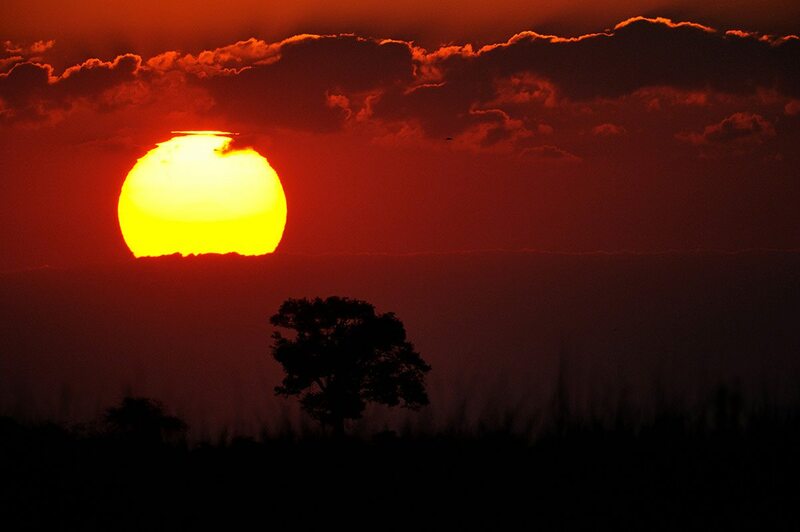 Expect an amazing sunrise from your perch at Kingston Treehouse.